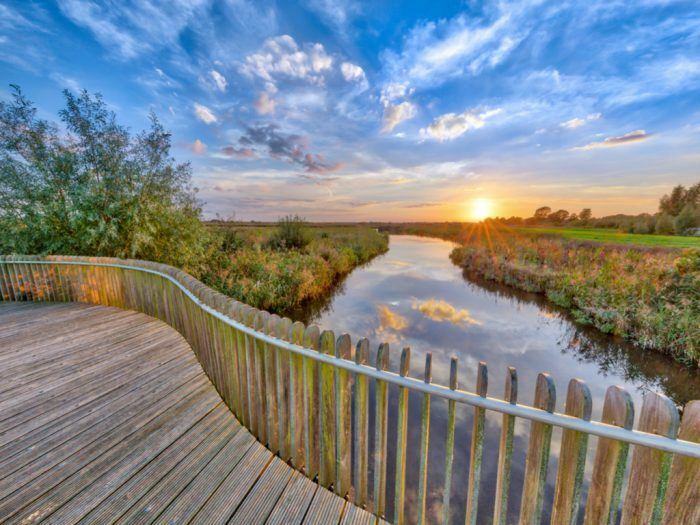 The construction of the large-scale water storage area De Onlanden in North Drenthe combines climate adaptation with nature and recreation. In case of extreme flooding, the area will protect the southern part of the city of Groningen. Water management in the area follows the seasons, ensuring a rich, varied environment, under the motto ‘Wet nature for dry feet’. The plans for De Onlanden are a result of the 1998 floods affecting a large part of the Netherlands and providing an acute threat to several districts of the city of Groningen. Province of Drenthe, Noorderzijlvest district water board, the Rural Area Department, the municipalities of Noordenveld and Tynaarlo, Natuurmonumenten (Nature Reserves), the Forestry Commission, LTO-North and the Land Register.